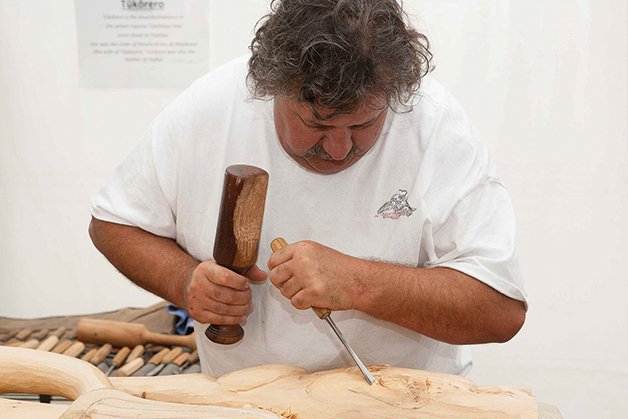 Ngāi Tahu does not have a recent history of whakairo rākau (wood carving), an art form that almost disappeared in Te Waipounamu about 150 years ago. Southern Māori ethnographer Herries Beattie inter-viewed dozens of Ngāi Tahu kaumātua throughout Te Waipounamu as part of the Otago University Museum’s ethnological project in 1920, and noted that most of his informants had never seen master carvers at work in their lives. One Kaiapoi informant told him he could remember seeing whakairo on the tauihu (figurehead) of waka still in use in his lifetime. Beattie found some ancient carved amo (bargeboards) exposed to the weather alongside the Tuahiwi Hall and estimated the last carvings in that district were probably done in the 1860s or 1870s. “Most of the whakairo here was done with the matā (flint), but it was so long ago we cannot describe it,” one of his primary sources from Puketeraki told him. Another elderly matua from Colac Bay said he had never seen local carvers at work. When waka with ornately carved tauihu and tauripa (stern posts) were lost at sea or destroyed by fire, when whare tipuna (carved meeting houses) were burnt to the ground or disintegrated through decay, all traces of Ngāi Tahu whakairo rākau vanished with them. Their loss poses a dilemma for today’s master carvers, because they have few surviving examples or patterns of traditional tribal carvings on which to base their designs. They rely on archaeological detective work to interpret patterns preserved in taonga such as hei tiki recovered from old pā sites. With the revival of Ngāi Tahu language and culture and the reconstruction of whare tipuna throughout the motu in recent years, these craftsmen have been given artistic license to express themselves through a combination of historical research and contemporary design. Te Waipounamu that is really turning heads. Both artists regard carved meeting houses as important visual aids for whānau, hapū and iwi to reconnect with their tikanga and whakapapa. As images of Ngāi Tahu’s ancestors come to life on the faces of their marae, they see a real sense of pride return as people re-establish their whakapapa links with their tipuna. Today people put up photographs of their tīpuna, but Riki says there were no cameras or photographers around 300 years ago, so carvers created that imagery through whakairo as a visual aid for storytellers to recount their histories. “For so long we as Ngāi Tahu were heard but we were never seen; so this huge renaissance of whakairo within the whare means we have finally been given an opportunity to reveal our face, so to speak,” Fayne says. “That’s just a matter of progression of who we are and where we are. 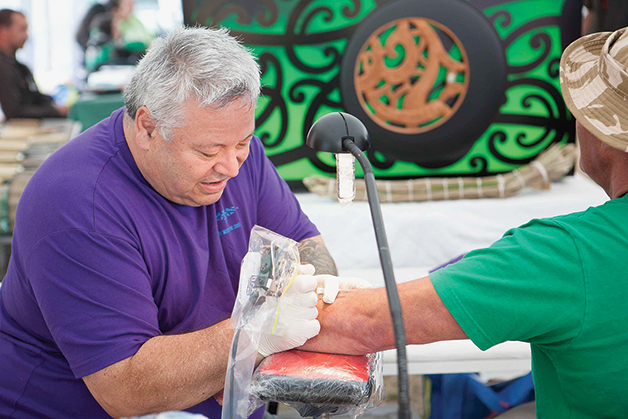 People are proud to be Ngāi Tahu. Both carvers grew up on the West Coast – Riki Manuel in Māwhera (Greymouth) and Fayne in Hokitika – and they have followed similar paths since they developed an early interest in Māori arts and crafts. Riki (Ngāti Porou) and two of his brothers were introduced to carving through a Māwhera cultural group, Mātauranga. He went on to begin a three-year carving apprenticeship at the New Zealand Māori Arts and Crafts Institute in Rotorua in 1977, under the strict disciplines of the late tohunga whakairo John Taiapa, head of the institute’s carving school at Whakarewarewa. He graduated in 1979 and went on to further study at the Wellington Business School. He established Te Toi Mana Māori Art Gallery in Ōtautahi in 1985 and has lectured and tutored at many academic institutions throughout New Zealand. These days Riki works as a Māori arts consultant and tā moko artist in Christchurch and is regarded as one of New Zealand’s leading master carvers in wood, pounamu, stone, and clay. He has completed many commissioned works for public display in Christchurch and has exhibited and sold his works widely internationally. Fayne Robinson (Ngāi Tahu/Ngāti Apa ki te Rā Tō/Ngāti Porou) followed in Riki’s footsteps as a graduate of the New Zealand Māori Arts and Crafts Institute in Rotorua in 1984. After graduating, Fayne worked for four years as a graduate carver. He tutored in Hokitika, and these days is based at Tuahiwi. He has established a successful international reputation for his contemporary style of carving and, like Riki, has also exhibited and sold works widely overseas. Fayne has contributed carvings to nine whare whakairo (carved meeting houses), including overseeing the design and carvings of Te Rūnanga o Makaawhio’s Te Tauraka Waka a Māui marae at Mahitahi (Bruce Bay) in 2005, the first new meeting house built on Te Tai Poutini in 140 years, and a fine new whare tipuna, Tūhuru, at Arahura last year. Both carvers believe their training at the Whakarewarewa wānanga gave them a good basic grounding in the disciplines of their art form, but say their styles are constantly evolving, so no two commissions are ever quite the same. The pair worked together on the design of carvings for the new Te Wheke marae at Rāpaki on the shores of Whakaraupō (Lyttelton Harbour), and say the inspiration for those carvings came from the jagged hills surrounding the marae. “We’re like amateur archaeologists and anthropologists in that we have an interest in Māori art history and we study it a lot,” Riki says. Despite their success in turning carving into careers, both artists say they have to be versatile and businesslike to make a living from their craft. 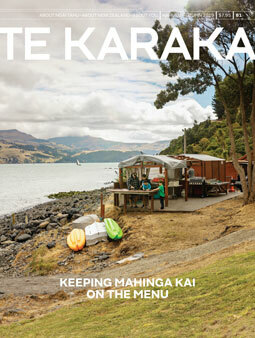 In New Zealand Māori carving is taken for granted, so their work is more highly valued overseas. Both carvers have exhibited and sold work in Canada, where it may fetch four or five times the price it sells for here. “Working in Māori arts is a hard profession to be consistently employed in, so if you put all your eggs in one basket you’re going to be unemployed most of the time,” Riki says. The more versatile the artist, the more work they are likely to get. Some of the biggest challenges the pair have is working with bureaucrats, tight budget restraints, understanding contracts, sourcing timber, and dealing with unreasonable attitudes that could compromise the integrity of the finished work. “When you go on to a marae you’re employed as a master carver with the responsibility of designing a carving that is done to a standard, and are then left alone to do that,” Riki says. Once a contract is signed, both parties need to show flexibility to allow for adjustments.